Alexandra Grausam is a curator, art manager and restorer. In a spacious historic building in Vienna she sits at the end of an oversized table. Before anything else, visitors to her studio and home in the Mariahilf district encounter the powerful smell of solvents. The neatly hung tools, however, give the impression of a doctor’s office. And, indeed, there is something surgical about it when Alexandra Grausam restores art and paintings in her apartment’s studio. Some of the works are leaning against the wall, others are waiting on floor to ceiling shelves to be re-revealed. She likes to work at night. When there are no footsteps pattering across the parquet floors she is accompanied by quiet music, or occasionally an audiobook – her focus through a tabletop microscope on fragile objects and fragments of artworks. Alexandra interchanges her role of concentrated focus on single fragments of art history with her vision for the burgeoning young art scene in Vienna and abroad: Her work as a restorer is an equal counterpart and compliment to her work as a curator and director of das weisse haus. Since 2007, initially together with Elsy Lahner, Alexandra Grausam has mixed the tradition-heavy Viennese art scene with the art society, which also functions as a temporary exhibition space. With its own studio system, it also serves as a living and working space for young artists. Alexandra has also collaborated with the creative center of the Vienna Business Agency: The result was a residency for an art theorist whose research results converted an artist’s collective into illustrations. In Alexandra Grausam’s apartment her two realities come face to face: Two tall double doors lead into the living room. Built into a small corner a screen hangs on the wall where a video of the young artist Bernd Oppl plays. Video art for your home. Next to this the artist collective Mahony is represented with a work. In big red letters reads, “Mit Zuversicht in die Zukunft” (With Confidence in the Future). Almost though it were to be understood as a programmatic announcement. Let’s start chronologically, with the foundation of the das weisse haus art society in 2007. What was the Viennese art scene like at that time and what was the mood like when you started the initiative? In the beginning I didn’t know Elsy Lahner. I was working on the cataloging of the art collection of a real estate developer. When he acquired a house and didn’t really have a use for the property in mind, so I suggested a concept for temporary use. He brought me together with Elsy, who was showing art in empty properties at the time. The following December we opened. At the time some off-spaces had just closed in Vienna. This showed that many weren’t able to survive the three year mark. For this reason it was clear – and also a bit cocky – from the beginning that we wanted to found an institution. What attracted you to the institutional framework for your arts society? The way we work. Both of us work in a very structured manner and from the beginning wanted regular opening hours, a clear program, a mission statement, etc. : the bilingualism was also important to us. That we used the word “Haus” in the name from the very beginning reinforced our self-image. That said, the fact that the actual house was white was not meant as a programmatic or political statement. Our first building was painted white from top to bottom. Das weisse haus was quite well received from the beginning. How have reactions changed since then? Of course, it’s a huge challenge to keep our standing. In the beginning we were really hip and had a lot of luck. However, our concept of temporary usage lead us to less than central locations and we had to take concern ourselves with idea that the audience in Vienna might be less mobile than one in another city. Our last exhibition – “random thoughts of a daily light” – really boomed all by itself. If one looks at the repertoire of your artists, it’s obvious that they’re working in many different disciplines. Karin Fisslthaler, the current artist in residence, is something of a musician, film maker and artist. Likewise for Viktoria Schmid, who is showing two installations in the exhibition. Is multidisciplinary and transdisciplinary work characteristic of the young arts scene in the city or is it more connected to your curatorial aspirations and interests? Since you mentioned those two examples: I consciously try to promote women and make sure that they are at least 50% of the program. In addition, I am fascinated primarily with the strong personalities of female artists who are active in several disciplines. Let’s put the focus on two concrete examples and talk about the meaning of young art, which is the focus of das weisse haus. What do you understand young to be? Naturally it has something to do with age. But even that isn’t a dogma. I try to show artists who have reached the end of their schooling. There’s something inquiring in their work. I also like freaks that focus on a topic to the very last detail. I find it captivating and engaging. However, it’s difficult because at the moment young art is occasionally a little too plain. That doesn’t mean that you should always act out, like the Viennese Actionists, but often young art is too cautious or decorative. They could be a little more daring. You mentioned Viennese Actionism. In Vienna they acted in a highly charged art historical environment. The city is characterized by the old guard, who were concerned with concepts like provocation and political ambition. Is there a danger of repeating this model too closely? It’s always been the case that issues are repeated and certain subjects keep popping up. Conversely, it’s not always possible to reinvent everything. What is striking is that those artists that we’ve shown in part in solo exhibitions have landed in galleries in the meantime. They’re very well-versed, also technically, in their medium. They’re ahead of their time: Artists like Hanakam & Schuller, Bernd Oppl or Alfredo Barsuglia know what they want to do and take the time to let things ripen. I was fascinated by the sensuality of the current exhibition. What interests you when you visit exhibitions? I go through exhibitions really quickly. And I notice that when I need more time, I’m fascinated. I visit exhibitions to close knowledge gaps and I really like it when I’m made to laugh or if there’s a certain humor that is evident. And because you mentioned sensuality, I like exhibition that move the senses. Are there places in Vienna that this happens more often? I like to go to Secession and was a big fan of the BAWAG Contemporary as well as the Generali Foundation, which are both no longer in Vienna. Also the art space Niederoesterreich (Lower Austria) is very special to me. In contrast to clean exhibition locations das weisse haus also operates a studio system. How does it work? The studio and artist in residence program brought fresh life to everything in 2013. A new dynamic often develops because international artists, curators, critics and theorists live and work here alongside local artists. Which places and locations do you show to your guests and which do you enjoy for yourself? In that sense, I’m very classic: I appreciate time in cafés, visit markets like the Naschmarkt, walk through the woods of Vienna or at Schönbrunn. Often, when I’m headed home at night, I stroll through the city on foot. For example from Skopik & Lohn, one of my favorite locations in the 2nd District, is a very broad path home, which I like a lot. Living and working in one place – here it’s possible to draw parallels between das weisse haus and your second professional role as a conservator. What does home mean to you? My apartment is my haven. I work here alone, sometimes with a bit of music or audiobooks, only the artworks ask me indirect questions. My work as a restorer opens a new approach to artworks up to me, it’s mainly about the fact that – as a doctor would say – it’s not going well for them. They have damage and I am trying to improve their condition. In contrast to my work at das weisse haus it’s very quiet here and runs without any bumps in the road. What artworks do you work on? How do they find their way to you? I worked with TBA21 for a long time. There I checked on the state of the art, usually there on location, to see if I could do something good for them and initiate proper handling. But often people just simply come to me. I also work for foundations, auction houses and private collectors. When a restorer visits exhibitions, they sometimes recognize when art is displayed incorrectly or under poor conditions. What are the challenges of das weisse haus’ temporary locations? The buildings are often very dominant, with difficult spatial structures and floor plans. Currently in the Kriehubergasse in the 5th District, we’re dealing with many small spatial units. One challenge is that the spaces often have many windows or doors and because of that less space for hanging work. In general, the artists get the places as they are. In adaptations I try to maintain the balance between the best possible presentation conditions and the basic character of the building. The room should be taken as it is, it should be alive and shouldn’t stand in the way of the art. To what extent does your own professional balancing act play a role in this challenge? One the one hand, the jobs are very connected, on the other I can act more freely with the das weisse haus. When, for example, the lighting isn’t great in das weisse haus, it’s less tragic and we also simply accept minor flaws. At the same time I profit from my restoration knowledge: Like when young artists place glass directly on a drawing I advise them to place a spacer in between so that the light doesn’t peel off the drawing through adhesion to the paper. On the contrary, as a restorer I have much more material-specific work. The ongoing search for usable locations calls for a talent in regards to the urban structure and architecture. Is this something that interests you on the side? I like architecture and am interested in empty spaces, because you can discover them anew, they often have a significant history. I remember one room where the floors and walls were carpeted, only one wall was mirrored. The location alone was so sensational that it was already an artwork. As for my apartment, well, I always wanted to live in an old apartment. The older I get the more I can also imagine living in a space of contemporary architecture. The apartment means a lot to me, because I can have my studio here and my children can also experience what I’m doing. Speaking of walls: Do you have art in your apartment, other than pieces waiting to be restored? When we moved in we wanted to try living without art and photography on the walls, everything was white until just a little bit ago. That’s changing little by little. What was the first work of art that broke through the white wall? That was a collage in the kitchen from the Viennese artist Claudia Larcher. Above the table. Do you remember the first time you came into contact with art? The reason I became a restorer can be explained with an anecdote: A long time ago I got to know a restorer, who explained to me that she had restored a badly damaged portrait of a woman. When she was done she had the feeling that the woman could see again. I was fascinated. Shortly thereafter I was in the restoration workshop of the Vienna Museums and was very impressed with the white coats and all the tools. My interest for contemporary art exists for a long, long time.My interest in contemporary art has existed for a very long time. Through my collaboration with Elsy and the work we do at das weisse haus, my approach has changed: Elsy explained an artwork from the artist collective Mahony to me, which at the time, was a room lined with cardboard boxes. I asked myself what the cardboard should tell me. I realized that contemporary art is about context, the senses and experience: awakening the curiosity of what’s behind – the non-visible. 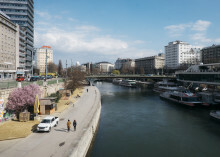 In recent years art venues in Vienna have experienced an upswing. Initiatives like curated by_vienna, Parallel or even Gallery Weekend attempt to position Vienna internationally, at least the art fairs do. At the same time the reality of life for young artists is, in part, much sadder and more precarious. What kind of development, which you as an institution also support, would you wish for the future? On the one hand, I would wish that donations for art would be tax deductible in order to motivate private people to support art. Moreover, that initiatives would be taken to make the life and work of artists more affordable. It’s a fact that at the beginning of any act of independence, it doesn’t matter if it’s an artist, graphic designer or restorer, money’s not exactly flowing in. I’ve also worked in a lot of bars. For artists it’s even harder, because in the best case they give a part of themselves and are always judged by others. This makes it difficult to overcome the balancing act of an everyday job. Many initiatives that have adopted Vienna as an arts city, originate from to the city’s engagement. How have you benefited from this? The city helps us through specific funding, and we collaborated twice with the Vienna Business Agency. There was the agency’s studio: this was a cooperation with das weisse haus in relationship to the residency of a theorist in residence. There was also a special call for proposals, awarded to Anne Elizabeth Moore. Her research results illustrated a comic collective, all of this was presented at a panel discussion. Through das weisse haus the rather unexpected topic of fashion also resulted in a network of completely new people, which was really exciting. On the other hand, a few years ago outside of das weisse haus, together with Elsy, we organized a project with the title “hard to sell, good to have.” It consisted of an exhibition, an auction, performances and a publication. This project was also supported by the Vienna Business Agency. Alexandra, thank you so much for this precise and extensive interview! The arts society das weisse haus will move on and open up new buildings with contemporary art in Vienna. Information about the program, current events and exhibitions can be found here. This portrait was produced in collaboration with the Vienna Business Agency and its creative center departure. Browse all previous stories to get to know more of Vienna’s emerging talents. We’ve chatted with a number of individuals who have defined Vienna’s creative scene, have a look.